Valentine’s Day might bring many different things to mind like love, hearts, roses, and chocolates. And if you had to choose one color to associate with Valentine’s Day, it would probably be pink, right? 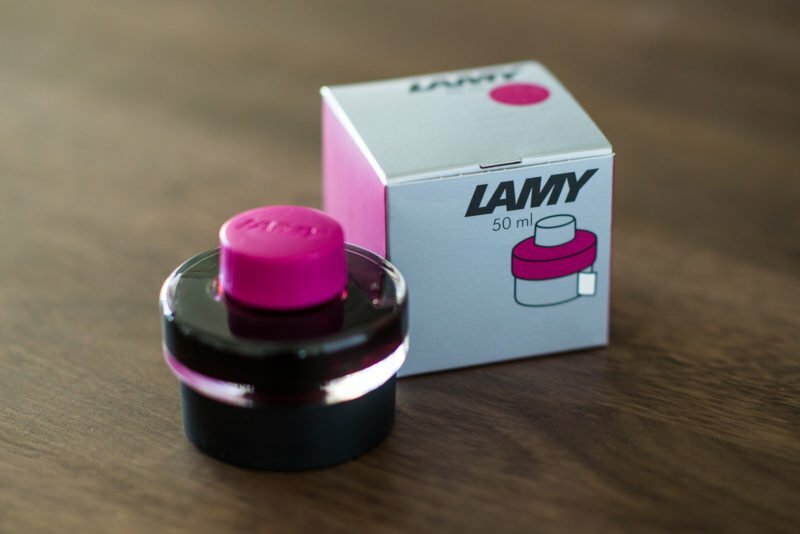 Well, even if you don’t have a Valentine (or can’t stand the holiday like some people I know), I’m here to try and make your Valentine’s Day just a bit better by giving away a bottle of the brand new Lamy Vibrant Pink ink! 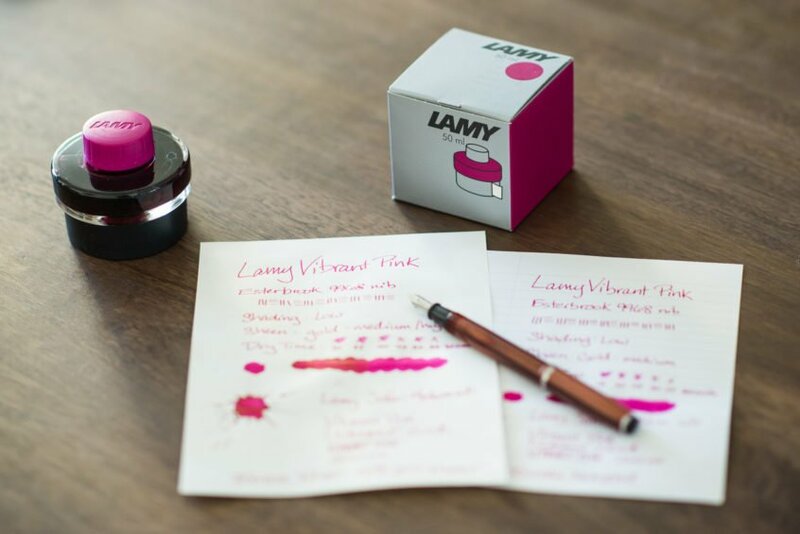 Fountain Pen Love is all about the love people have for fountain pens, so is there a better giveaway combination than Valentine’s Day and Lamy’s newest pink ink? 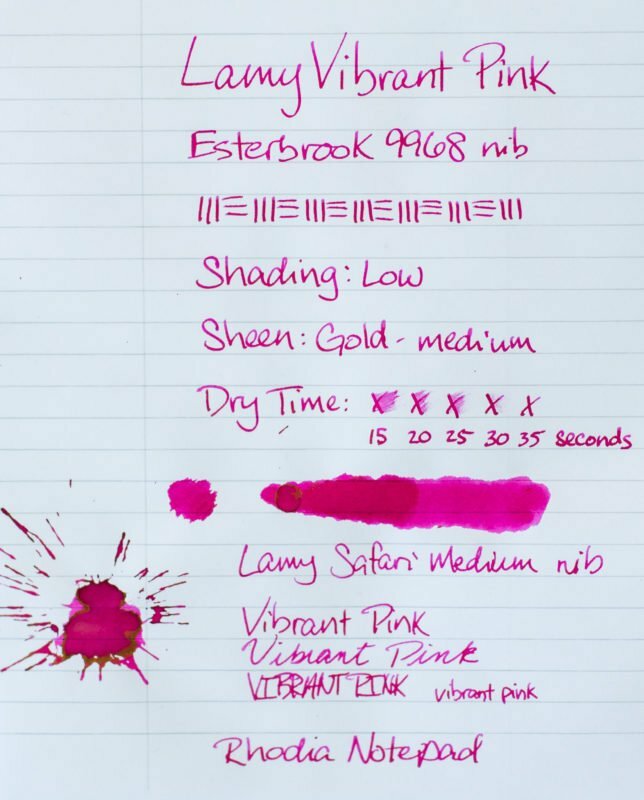 Speaking of Lamy Vibrant Pink, here are my first impressions of it. 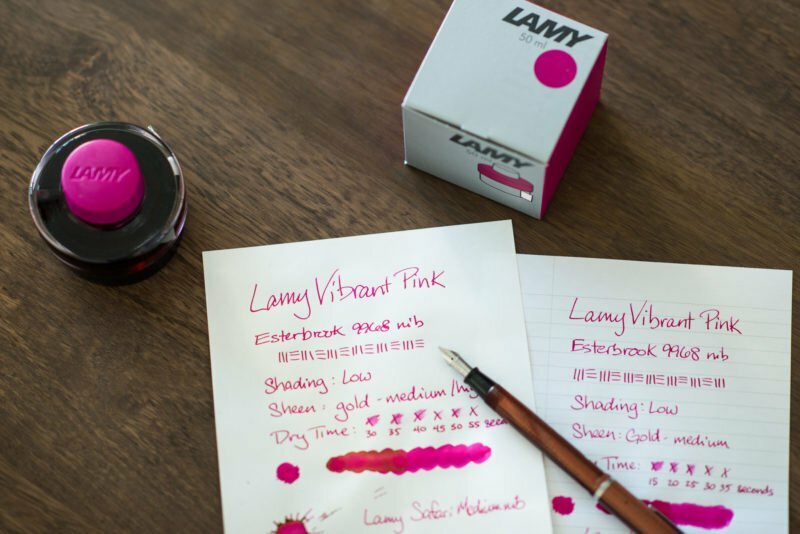 The Lamy Vibrant Pink is a very nice ink to write with. 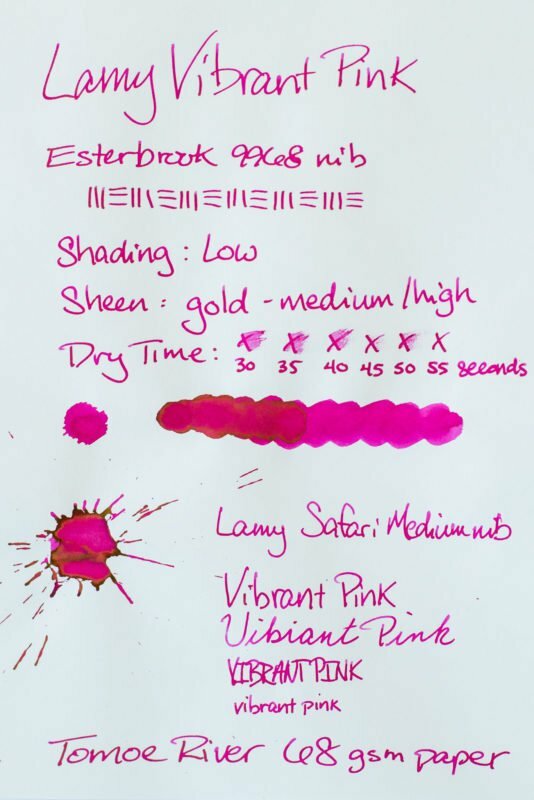 The Vibrant Pink seems to be a very well-behaved ink. I inked up two different pens to test it out: An Esterbrook J with a broad 9968 nib and a Lamy Safari with a medium nib. I had no flow issues with either pen. I used two different papers for my testing: A Rhodia notepad and some Tomoe River 68gsm. I experienced no feathering or bleeding and only very slight ghosting. The ink is, as the name implies, a very vibrant pink. I inked up a pen with some Iroshizuku tsutsuji to compare and have to say I can hardly tell them apart. The tsutsuji is a bit more saturated and darker than the Vibrant Pink, but the color is nearly identical. The Vibrant Pink does have a nice gold sheen that comes through in normal handwriting. I was able to see it with both the medium and broad nibs used for testing. In splats, it doesn’t sheen nearly as much as the tsutsuji does and the sheen takes on a bit of a green tint where it’s very heavy. It has what I would consider to be an average dry time. It is also not very waterproof, but that’s to be expected from most inks these days. Overall, I think I’m going to enjoy this ink. While it is darker than I thought it would be, it’s not an intensely saturated ink. It is also not a light pink, which I find are hard to use for normal writing. In my opinion, this could easily replace a red or orange ink if those are colors that you find yourself using often. This brand new box of ink could be yours if you’re the winner! There is one bottle of Lamy Vibrant Pink up for grabs here. There will only be one winner. Entries for the giveaway will close at 11:59pm PST Wednesday, February 14 2018. Winner will be contacted and announced Thursday, February 15. If the winner does not reply within 1 week, another winner will be chosen. Omg!!! I am so loving this color! Yo pretty and romantic ???? Maybe this is the pink for me! Love this color! Thank you for the opportunity.